And somehow, the poor guy going for the worst ride of his life survived completely unharmed, according to witnesses. Flash floods are ravaging the Houston and Galveston, Texas, areas right now, and already there have been more than 500 water rescues, along with at least 19 deaths, with more than a dozen still missing. But every so often, someone in a desperate situation manages to survive, and the video is shocking. It’s a little hard to tell what got the driver into this situation, so try to withhold judgement while you consider how crazy-fast flash floods can turn dry ground into a nightmarish deluge (plus, it’s not like someone wants to destroy a car and completely endanger their life, as that’s a pretty godawful way to go, so there’s that). 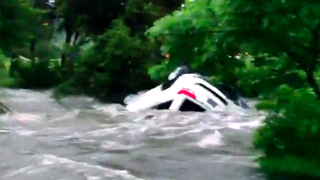 The video starts right in the middle of the action, as the Jeep Grand Cherokee appears to be stuck in a miniature version of the Mississippi River. One quick cut later, and it’s now nearly completely submerged in a miniature version of Niagara Falls. Somehow, the driver is still alive inside, still conscious, with their foot on the brake pedal. And somehow, the electronics are all still working, despite practically the entire car underwater. A crowd of onlookers and would-be rescuers gather nearby, completely helpless to rescue the guy inside, lest they, too, be swept away by the raging torrent. And then the car breaks loose from its footing, and we see the exact demonstration of something going from “oh, wow, that’s pretty scary, hope he’s okay,” to the manic string of nervous profanities that string from the guy shooting the video. At which point the irresistible power of the water completely flips the car. Like I said, we don’t the circumstances that led to this Jeep getting swept away. But just as a reminder, if you see a flash flood coming towards you, don’t think you can just drive through it.